An outstanding early work by Rubens’ most talented pupil, Anthony van Dyck (1599–1641) has been provided on permanent loan by the King Baudouin Foundation. The Head of the Apostle Matthew is the only composition from the famous Böhler series displayed in a Belgian public collection. Courtesy of the King Baudouin Foundation, the Rubens House is showing an early work by Anthony van Dyck, representing the Apostle Matthew as a powerful yet contemplative male figure. The panel, part of a series of Apostle paintings, was recently acquired by the King Baudouin Foundation through a bequest and is the only Van Dyck Apostle still in Belgium. Having funded the restoration of this deftly executed Apostle’s head at the Royal Institute for Cultural Heritage (KIK-IRPA) in Brussels, the Foundation has now placed it on permanent loan at the Rubens House. The action firmly reflects its mission to preserve, protect and valorize important works from the nation’s cultural heritage and to make them accessible to the public. 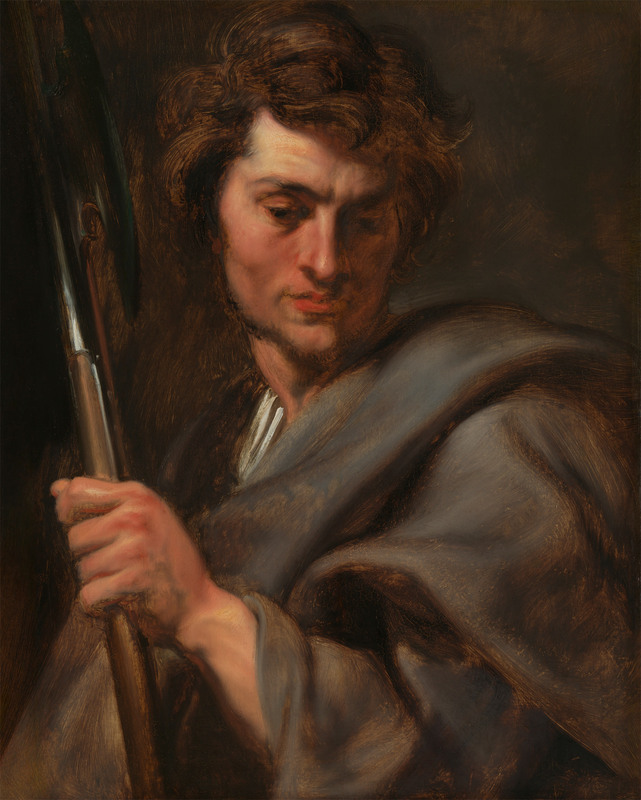 Van Dyck shows Matthew holding a halberd, the weapon with which the Apostle was martyred. He has modelled the figure with fluid brushwork that creates an even painted surface in which only the occasional stroke can be made out clearly, most notably in the hair in the cloak. He then applied the highlights with broad and exceptionally thick strokes – an impasto that is readily visible in the Apostle’s hand and face. The most striking examples, however, are the thick streaks of white paint on Matthew’s white shirt and along his halberd. The young Van Dyck might have drawn the immediate inspiration for his Apostles from Rubens, who had already painted an Apostle series for the Duke of Lerma around 1610. Van Dyck must have seen these examples in his mentor’s studio. It is thought that he painted his own series with Christ and the Apostles between 1618 and 1620: the style is in keeping with his works from his so-called first Antwerp period. The King Baudouin Foundation’s Apostle Matthew is part of the ‘Böhler series’, named for the German art dealer Julius Böhler, who acquired it from an Italian private collection in around 1914. Böhler then sold the series on to various private individuals and museums. The Matthew composition is the only example of a Van Dyck Apostle in Belgium. Eight of the thirteen compositions in the series have survived, some of which are privately owned. This latest permanent loan is the seventh occasion on which the King Baudouin Foundation has enriched the Rubens House collection. Previous loans of this kind include the decorative silver jug and dish by Theodoor Rogiers, Lucas Faydherbe’s Hercules, the De Ganay manuscript to Peter Paul Rubens and two paintings by Jacob Jordaens. They underline the Foundation’s mission to preserve and protect our heritage and make it accessible to the general public. In the case of the Van Dyck panel, this protection is two-fold: not only did the Foundation purchase the work, it has also funded its analysis and much-needed restoration at the Royal Institute for Cultural Heritage (KIK-IRPA) in Brussels. The first step at KIK-IRPA was to clean the panel, following which the yellowed varnish layer and areas of overpainting were removed. Cracks were repaired and losses in the paint layer filled. Technical examination confirmed something that can also be seen with the naked eye: Van Dyck did not paint the vertical strip on the left. Not only this work, but all those making up the Böhler series have been enlarged in the past. The main problem that needed to be addressed, however, was the panel’s wooden support, which has suffered woodworm damage. The old cradle had to be removed and replaced with a new system, to which end the wafer-thin panel was given a secondary flexibly attached support. This revolutionary restoration technique is based on a mathematical formula that provides exactly the necessary support without interfering with the panel’s natural expansion and shrinkage. The cradle on the rear is now a movable wooden slatted construction that functions as a flexible back, giving the panel greater freedom of movement. It is constructed from Sitka spruce – a type of wood with high elasticity that is also used in the aviation sector. The restorer Aline Genbrugge learned the technique from its developers, Simon Bobak and Ray Marchant, in London. This is the first time the method has been used in Belgium.